To succeed at a DIY wedding and making your own food you will need some help. 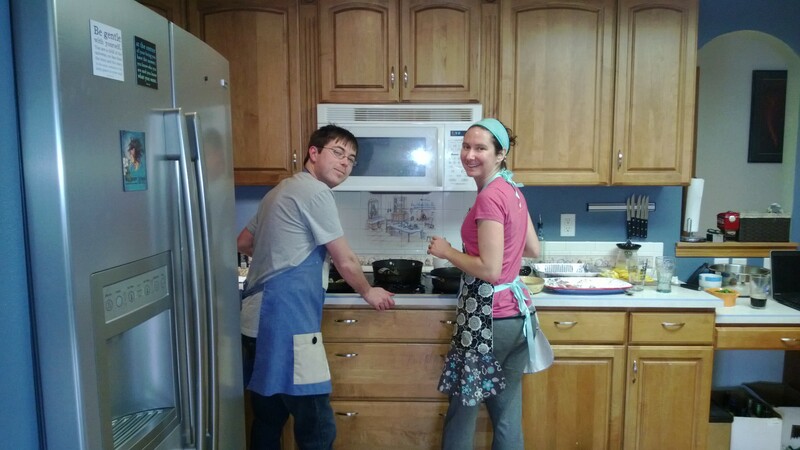 We enlisted the help of my mom, brother and good friend Devi for a Sunday afternoon of cooking. 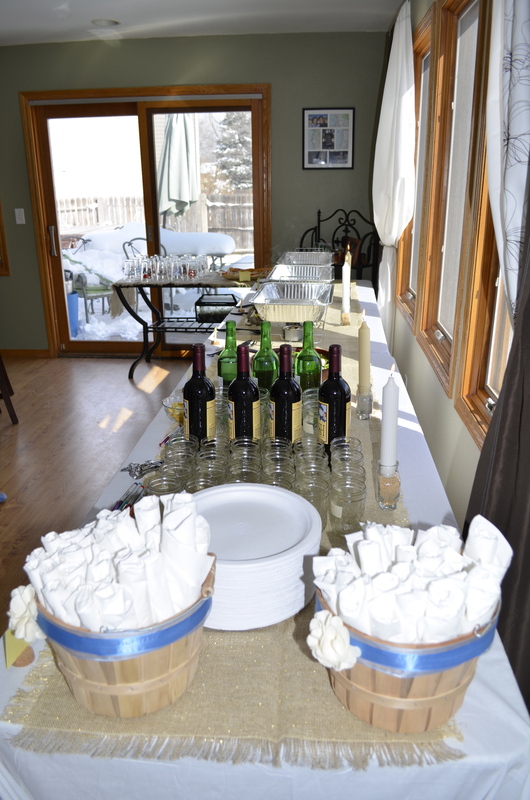 We prepared as much food as we could the weekend before the wedding. We were able to then freeze the food and start it defrosting a few days before the party. We prepared enough food for about 50 guests total. I should also note that to make the day-of food preparation stress free we decided to do the party the day after the ceremony. We returned from the ceremony late the following morning and had time to eat lunch and relax for a few hours before we started preparing the day-of food. I think we were all a little surprised at the amount of time we had and how smoothly getting the food out went. Me and the husband-to-be hard at work. We splurged a bit on a cheese platter from a local cheese shop in town, but the cheeses were delicious and the presentation phenomenal. We also purchased mini-cupcakes from a local cupcake lady in town. We went for mini-cupcakes so that people could easily have a bite (or several bites) and easily try the various flavors. However, the rest of the food we made ourselves. Most of the food was able to be prepared ahead of time and frozen. Slice the oranges to about 1/4 inch thick. We used a manolin. Top with chopped fresh fennel, thyme leaves, olive oil, salt and pepper. Combine all the ingredients and form into small meatballs. Cook in olive oil for about 10 minutes until cooked through. Lay on a cookie sheet with parchment paper and freeze. Once frozen you can put into a freezer safe ziploc or container. 2 bunches of a leafy green such as kale or escarole, wahsed and chopped. Heat the stock and add frozen meatballs to start defrosting. A few minutes before serving add the leafy green of your choosing. Stuffed shells I think of as a classic dish to make and freeze ahead of time. We made some with pancetta following Giada’s recipe and some meatless. My brother chopped so much parsley his eyes started tearing. 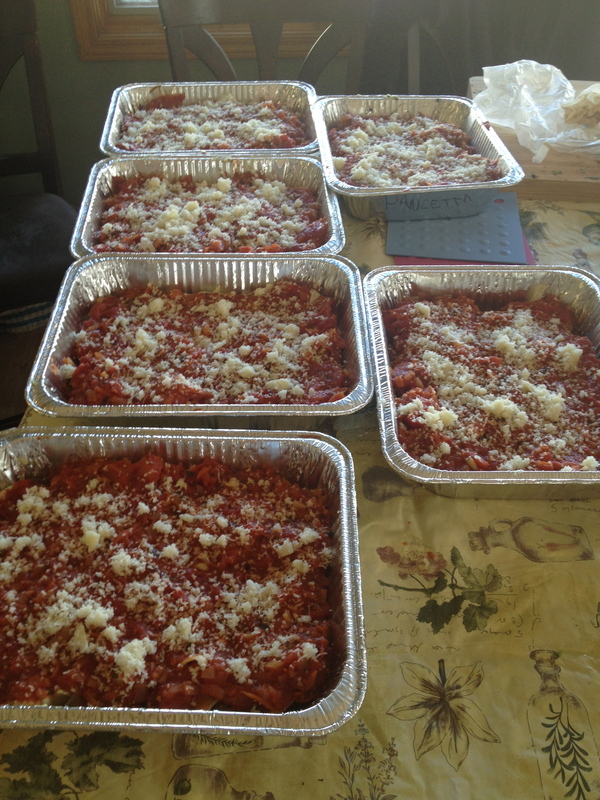 In total we made 6 trays of stuffed shells. The final dish we prepped was lemon chicken. We egged and floured then fried the chicken. In hindsight, the floured and fried chicken did not hold up well to reheating so I would recommend simply cooking the chicken ahead of time. Other than that the lemon chicken was delicious. We followed a recipe from Tyler Florence. 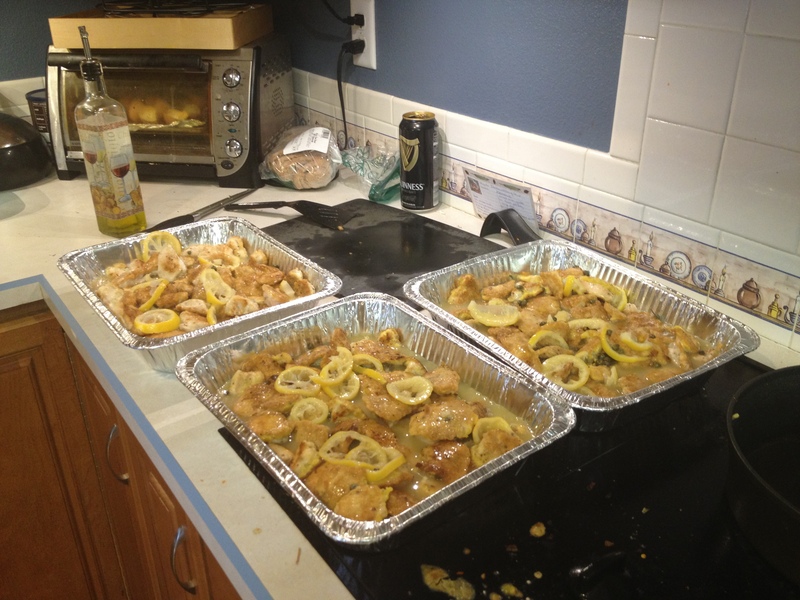 We made 3 trays of lemon chicken. The day of the party was a breeze. We did the party on the day after the ceremony so we would not be rushed preparing the food between the ceremony and party. My friend Devi picked up and brought the cheese platter to our house. The cupcake lady delivered and displayed the cupcakes. I luckily have a double oven so I was able to put 4 trays of stuffed shells in one oven and the 3 trays of lemon chicken in the other oven about 2 hours before guests were supposed to arrive. Although we took the trays out of the freezer 4 days before the party, the trays were still a little frozen which is why we gave them 2 hours. 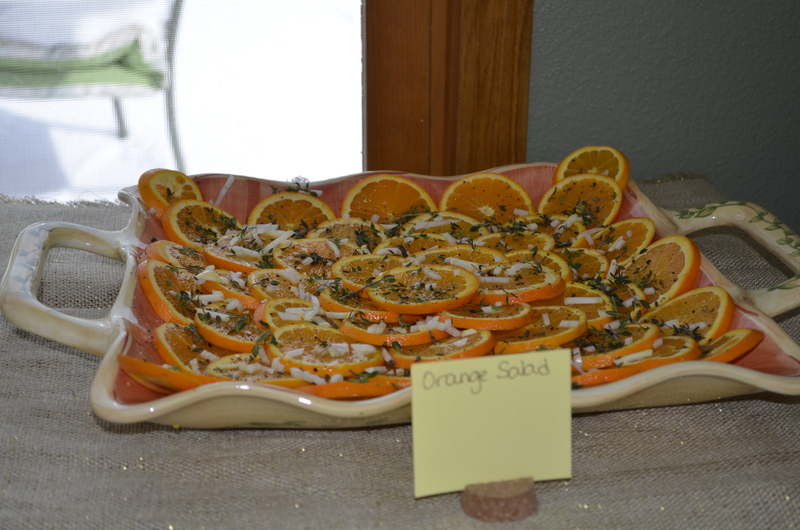 My mom prepared the green salad and my husband prepared the orange salad. We used disposable plates and bowls, but silverware we bought at Sam’s Club. We decided to do disposable plates and bowls because it is hard to purchase enough and they take up a lot of room in the dishwasher. The silverware was inexpensive and could fit in a single dishwasher load. We also used pint glasses for beer (my husband buys one everywhere we go so we have no shortage) and jelly sized mason jars for wine. Again we decided to use glassware because we had enough and they are easy to run through the dishwasher.